Central Arkansas is joining the recent trend of changing up a field or court to be unique. Or maybe it's because Boise State has had so much luck with their blue turf, although A Hot Cup is more a fan of their basketball court. Then, Eastern Washington joined in on the fun with their "Make Your Eyes Bleed" red field. Finally, the Oregon Ducks, who normally make headlines for their flashy football uniforms, made a splash on the basketball court with a hideous new design. All of those flashbacks lead up to the newest contributor to unique field designs, the Central Arkansas Bears. 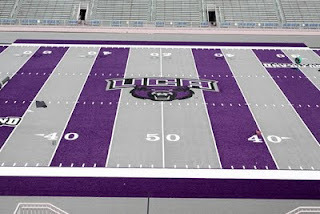 When not serving as the college of Scottie Pippen, Central Arkansas apparently comes up with a pretty cool field design. Check it out below.